Hannah is my beautiful 20 year old daughter who is getting married to Luke Crouch at the end of this year. To celebrate her birthday and engagement we had a family dinner at a great Italian home style trattoria ‘ Bannerman’s’ in Glenhaven, which is a hinterland suburb of Sydney. The food here was wonderfully authentic, the service was truly welcoming and the pride of the establishment was heartfelt. They also hold a growers market in their car park once a month followed by a long lunch. After delicious platters of antipasto, pasta, spatchcock & beef we headed back home to sing and cut cake. Not just any cake, but one inspired by Emma Galloway from blog site ‘My Darling Lemon Thyme’. I have been in awe of Emma’s genius since I started blogging. When I saw her recent post on flourless chocolate wedding cake, decorated with meringue icing and purple lisianthus, that she made for her own wedding, I was taken. 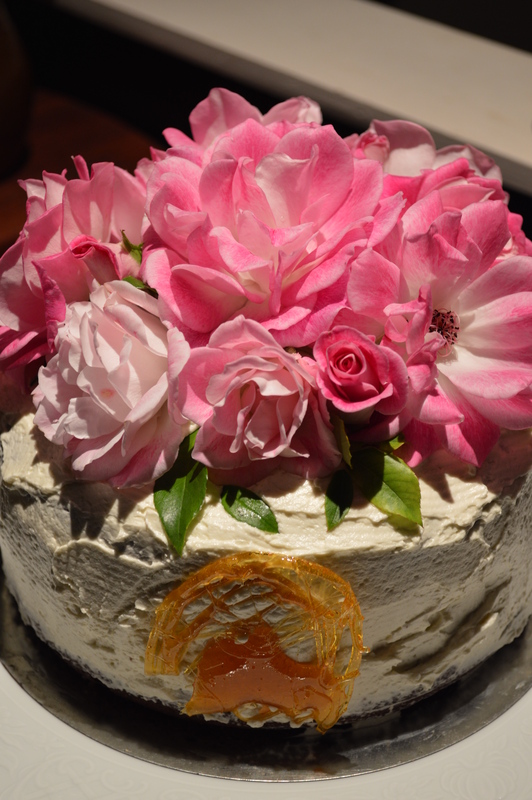 I modified the recipe just a little by using less butter in the frosting – it still worked perfectly and as lisianthus were temporarily unavailable at the Sydney flower Markets due to Mothers Day, I used my homegrown pink iceberg roses instead. The cake making was time consuming but I enjoyed every minute of it & the cake was the talk of the evening- a perfect way to end the Italian meal and bring the celebration back home.
. . . Guess who’s making the Wedding Cake??? When a husband turns 40!